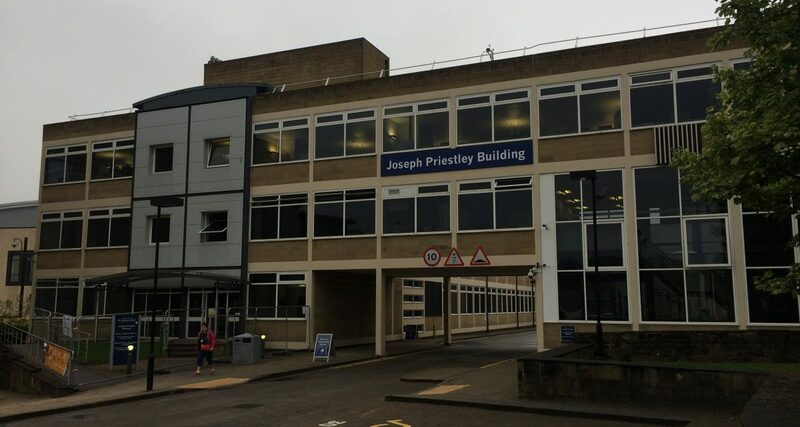 Longworth were appointed by Bardsley Construction for the design and installation of bespoke feature anodised aluminium projecting finned box rainscreen cladding for the University of Huddersfield’s dedicated science building. 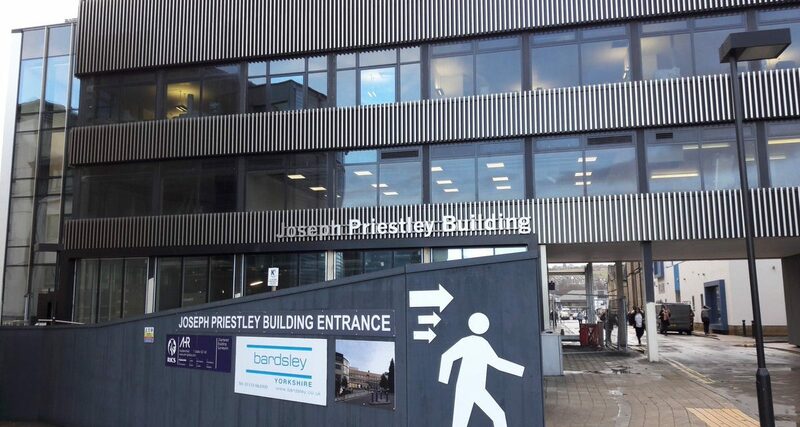 The £6m transformation of the ‘West Building’, was renamed the ‘Joseph Priestley Building’ commemorating a local scientist famed for his discovery of oxygen. 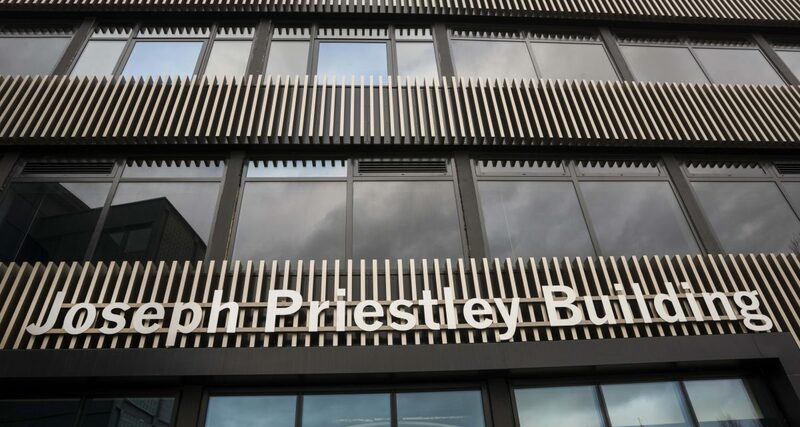 The exterior of the building was given an impressive facelift and involved extensive over-cladding of the whole building with feature metal fin cladding. The client wanted a dramatic change to the façade and AHR Architects worked closely with Longworth to design and build a bespoke rainscreen cladding system that would exceed the client’s expectations. 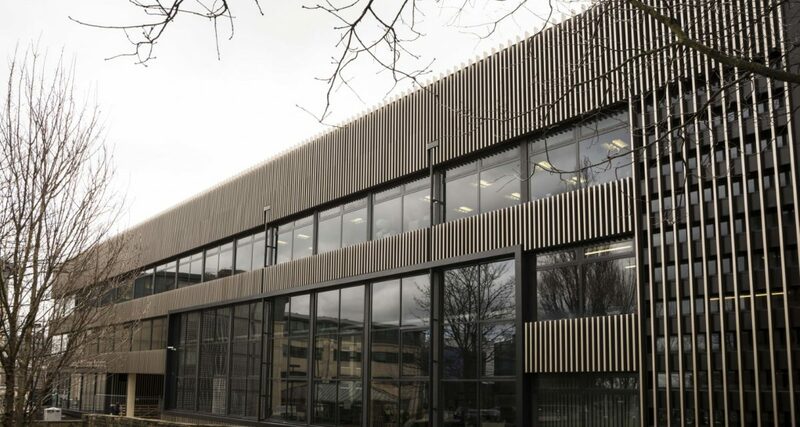 Longworth worked in association with a number of their key suppliers, Vivalda, Plasmet and SFS Intec to develop the design and build of the rainscreen cladding façade. 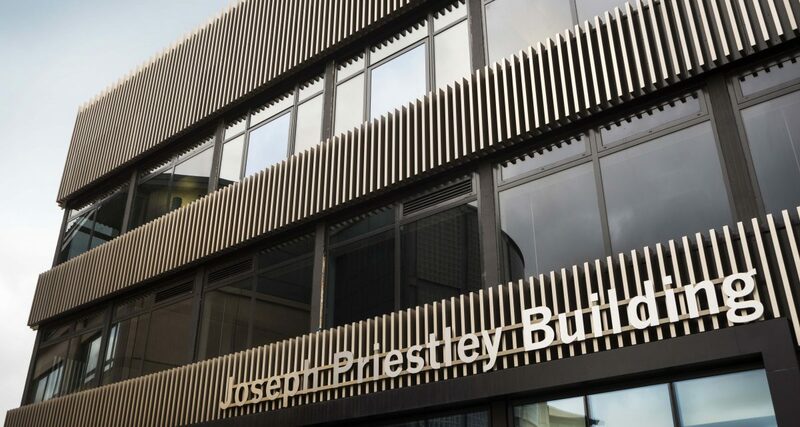 The entire existing façade was over-clad with a bespoke rainscreen cladding system from Longworth. The system consisted of extruded aluminium box sections at 150 x 50mm at varying lengths to create a finned effect across the entire façade. 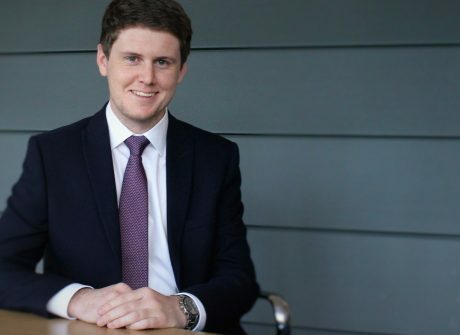 Longworth developed a design brief and contacted Vivalda and Plasmet to come in to their offices for a design team meeting to work out the details of the design proposal. 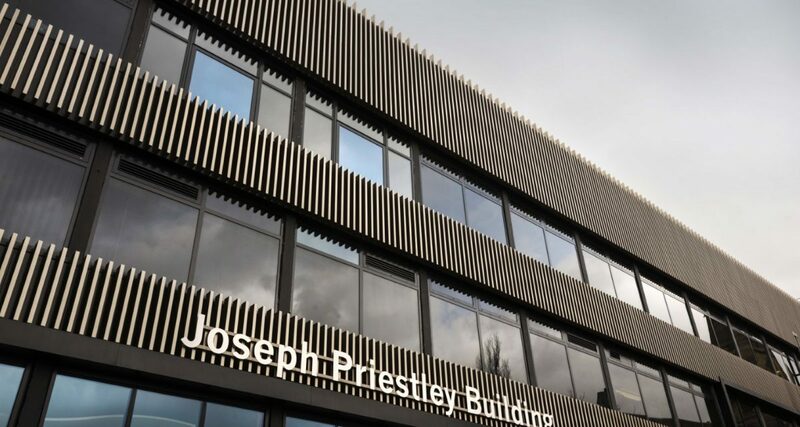 It was agreed that the best method to achieve the desired design aesthetic was for Plasmet to fabricate and anodise the fins as individual box sections and for Vivalda to produce 4000mm x 1500mm sections to ACM to carry the aluminium box fins. Longworth would then assemble the two at their workshop to ensure high levels of quality control. The whole external façade was installed using MEWPS as this was a faster option for an over-clad. Each extruded aluminium box section was fixed back to the ACM from Larson for ease of installation and each panel was made to specific dimensions that not only produced the desired finish but meant they could be handled as individual panels by two operatives. A check process was implemented after each panel was assembled by the Workshop Manager, then marked on the back of the panel and checked off of the scheduling sheet before being packed in order they were to be taken off for installation on site. Longworth’s Workshop Manager hand built a jig out of heavy hardwood to assemble each panel. This was checked and cleaned every day to prevent swarf scratches on the anodised box fin sections. The panels were then checked again on-site. 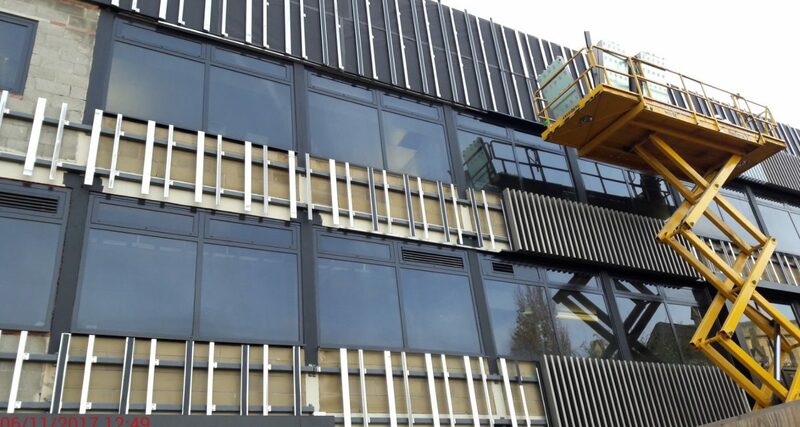 Stop points were implemented to again check the quality of the panels, installation and alignment of each section of the façade. 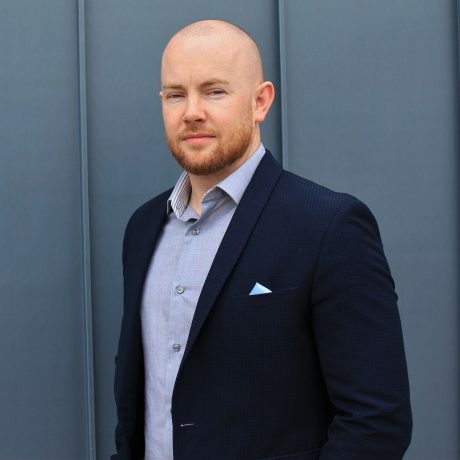 The project was won by Steven Jones superbly delivered by Lee Smith with design from Tom Mead. With a big thank you to Bardsley Construction for the kind use of their photographs. Credit and thank you to Bardsley Construction for the kind use of their photographs.